I love tennis. It's a great sport which relies on skill, quick thinking and mental strength. I played tennis competitively in high school and now I enjoy the sport recreationally. 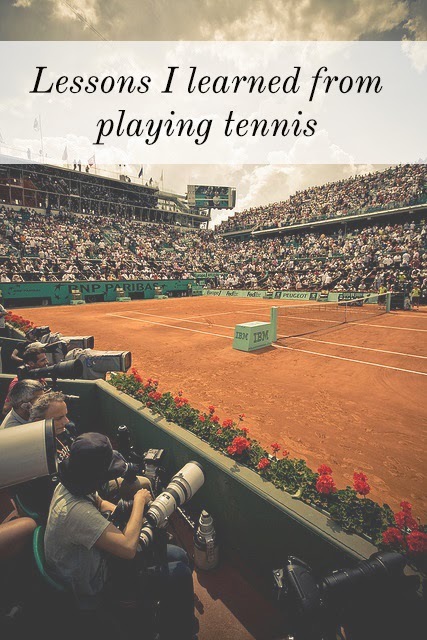 I was watching a Wimbeldon match last week when something dawned on me...tennis is a great life teacher. Many lessons I've learned were in fact learned on the court. Many people do not love what they do and I think that is a shame. Finding something that you are passionate about in life will help you set and realize your goals immensely. When you love something - you will do anything it takes to keep it in your life but it will never feel like work. So start with love, and the rest will come. In tennis this is really important. You have to commit to your serve, shot, tactic and always follow through with it. Last minute decisions can negatively affect your game. In the real world, same thing. If you make a commitment - don't back out last minute. Following through with commitments speaks volumes of your character. Consistency is key to a balanced life. This is the hardest lesson because success is a tricky concept. Some think it's earning a lot of money or becoming famous. When you focus on growth, you're in it for yourself. Growth means learning and practicing your skill to fulfill your own personal goals. Success focuses too much on outside achievements and neglects the path taken to get there. Every successful person in this world has put in work to get to where they are and comparison just brings you down. Focus on your goals and your why and you will always be content with your achievement (no matter their size). Change is a fact of life and the more resilient you are the better. There is no direct path to your goals and you may encounter hard times. These times won't last forever and you will make it through. Keep your eye on the prize and get back in there. Nothing worth having comes easy! If plan A doesn't work out, remember that you still have the letters B-Z. No matter what - never give up on yourself. Keep pushing, keep learning, keep trying. Persistence pays off and builds character. Let the failures of the fast fuel your growth.